Got a slight dilema. The tow hook is missing off the car. I guess it broke off sometime long ago. I am thinking about finding another 240z and cutting the tow hook off of it and welding back in place. I am little worried though. Once I get one welded back on will it have the same amount of strength to support towing(hopefully I will never need it towed). I need to get one on so the bottom part of my grille stays on. Anybody ever have the same problem? That's not a tow hook. It's simply a bracket that supports the bottom of the grille and nothing more. Perhaps yours was used as a tow hook which might explain why it's missing. Tow hooks are bolt on items. Tie-down hooks are bolt-on items. They were used to keep the cars from getting tossed around on ships from Japan. "If you find it necessary to have yours towed, it is important that the towing rope be fastened only to hook that attach the frame, as illustrated. The rope must be routed under the bottom edge of the bumper. Admittable load of the hook is less than 2,200lb." 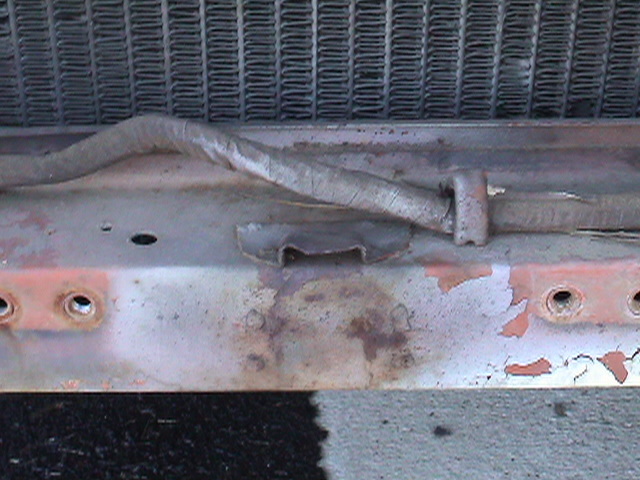 The missing bracket supports the bottom of the grille and the lower valance panel. Here are a couple of pics showing the bracket, and the tow/tie down hooks. The one on the left is definitely "hook" shaped, whereas the one on the right is more of a bracket with a hole in it. I've seen a few Z's with the hooks mounted to the rear bumper brackets. I think these were often removed by the dealer, from what I've read. Ditto the above info. Do NOT uese the bracket that you are talking about for towing, it WILL come right off as this is not what it's designed for nor is it strong enough for the task. Had you only realized that you needed this a few months ago when I still had my two parts cars I probably could have supplied you with one. Best bet is to hit the junk yards or contact someone with a parts car and get it that way. Just weld it back on, there's no concern about strength since it's only a support bracket for the front grill and lower valance. I've done a lot of research on the subject of these 240 tie down hooks and this is what I've found. The hook on the left in the first picture is a Banzai Motorworks, www.zzxdatsun.com, reproduction right front and right rear tie down hook, they are the same. The item on the right is a Banzai Motorworks reproduction of the left front tie down bracket. For the 70-mid/late 72 the left rear is a mirror image of the right rear hook. The rear hooks should be mounted so that the open sections face inboard. The second picture shows the left rear hook for the mid to late 72s and 73s. It is huge compared to the earlier left rear hook. They were used to secure the cars on the ship. I could not find a factory service bulletin about removing these hooks during the PDI (pre delivery inspection) from 240s. However. I did find 2 bulletins about removal of the rear hooks from 74.5 (Nissan nomenclature) 260s & 75 280s. The 2 bulletins are TS 73-78 & TS 75-053 . The first bulletin wants them removed to prevent their use for towing and the second bulletin is much more forceful stating that under no circumstances should dealers allow the mentioned models to leave their shops before the rear hooks have been removed. 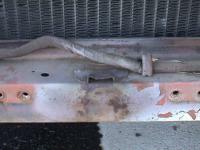 I did find one, and only one, bulletin that called such a part a towing hook. It is bulletin TS 73-56 but if references the L-620 truck.